No doubt you have heard of Jean Christophe-Novelli. 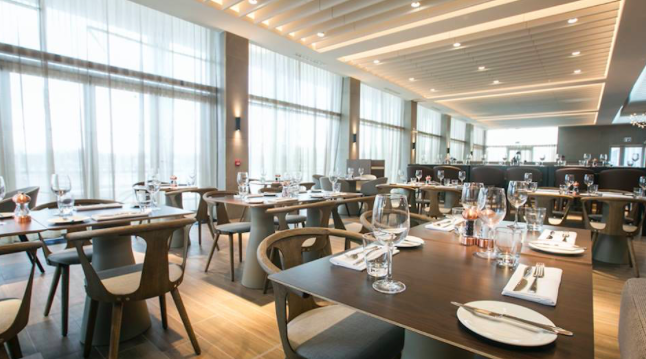 A renowned French chef who together with local Executive Chef Jim Mulholland, recently opened Novelli at City Quays. Based on the river at AC Hotel Belfast, the restaurant brings Mediterranean flavours to the city using the best of Northern Ireland’s produce. The menus include products from Hannan Meats, Abernethy Butter, Ewing’s Seafood, North Down vegetables, Draynes Farm ice cream, Yellow Door baked goods and more. Diners enjoy delicious dishes like local seared scallop with cured salmon belly, peas, sea vegetables and parsley root, in a setting that is nothing short of spectacular with stunning views of the Titanic Quarter. Why not enjoy lunch al fresco on the terrace or pre-book the popular Afternoon Tea for two? In fact, why not book in for the night and eat around the clock! On the river at City Quays close to the “Big Fish” Salmon of Knowledge and next to the Obel Tower and Harbour Commissioners.